My mother and I are very different. She was once president of the Junior League of Savannah. Now she is president of the Colonial Dames of Georgia, the second largest state chapter of Colonial Dames in the country. My mother is so important that she recently had her photograph taken with Robert Redford in front of the Andrew Lowe House in Savannah, a Colonial Dames property that was being used as a movie set, even though Robert Redford declined to wear the official Colonial Dames necktie. I am proud as can be of my mother. And I tell her all the time how proud I am of her, and I haven’t even begun to list all her accomplishments. Me, on the other hand, I ended up being a Savannah debutante against my will. Yes, it is possible when you are young to end up having to endure things like that even if you don’t want to. I remember crying while I curled my hair with hot rollers. I didn’t like hot rollers and I didn’t feel comfortable dressing up like that and I certainly hated going to all those parties. It was just not my thing. I got into the Junior League in my 20s, most likely because of my mother and not because of anything I had done, and wondered what I was doing there. Needless to say, that episode of my life lasted just a few meetings. I have asked my mother about the Colonial Dames, but at this stage of the game, she doesn’t push it. We’re long past that point. 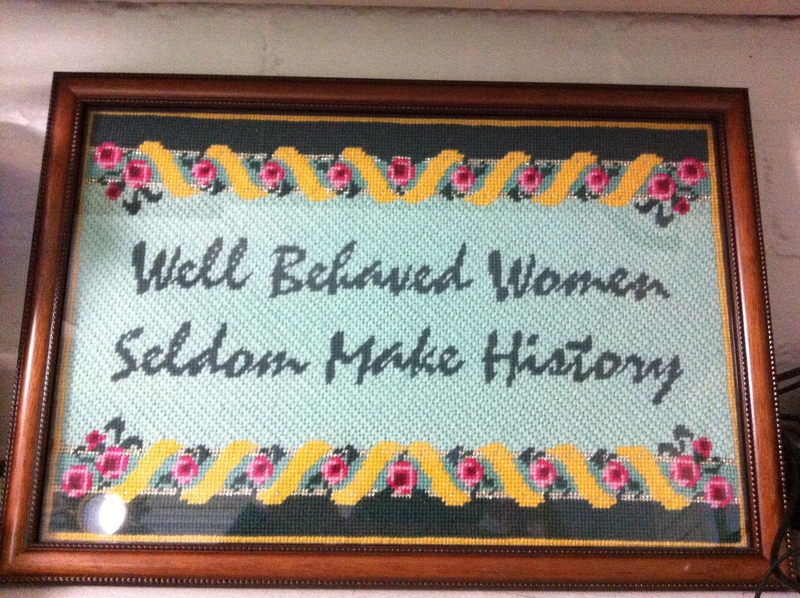 Several years ago, my mother, whose hobby is needlepoint, gave me a picture. I have loved that saying my whole life. The exact quote was actually by Laurel Thatcher Ulrich, a woman whose name alone would probably qualify her to be a Savannah debutante. Laurel Thatcher Ulrich was a professor of history from Harvard and once president of the American Historical Association. I figured that if a professor of history from Harvard reported that well behaved women seldom make history, it was probably true. Why should I bother being well behaved? Where the heck was being well behaved going to get me? For many years, I had the framed needlepoint picture from my mother to me in my studio. Then certain events, which I won’t go into here, transpired. Even though I completely understood what it was all about – and it all involved me NOT being well-behaved in the eyes of people who didn’t have 100 percent of all the facts – I thought it was time to remove the revered picture from my studio and tuck it away on a shelf in my office where I alone could admire, understand and appreciate it. My mother came to visit recently and wanted to photograph her work of art. Horror of horrors, I couldn’t find it! I looked everywhere, but by the time she left, I still wasn’t able to produce the picture for her. I assured my mother that I really loved her needlepoint picture and that it meant so much to me. I was sure I had neither given it away or lost it. You know how you look at things so often sometimes you don’t even know they are there? You know how you hear certain words so frequently they become emblazoned in your identity? This weekend, I was sitting at my desk when I turned around to look for something in my book case. I suddenly saw her picture. It was hidden in plain sight! because apparently she wants to include this thought in her resignation speech as president of the Colonial Dames of Georgia. Why, I am not sure, as by all accounts, my mother has been extremely well behaved. She is liked, loved and admired by all, not the least of which is for how graciously she has played by all the rules. Or so it seems to me! I have been calling my mother over the last few weeks and asked her how her speech is going. I offered to read her drafts, but apparently there are no drafts so far to pick over. At my brother’s rehearsal dinner, about 30 people were gathered at the end of the festivities. My father approached me. I was a little hesitant, as you never quite know exactly what he is going to come up with. I wasn’t sure if he was going to praise me or humiliate me. “Remember the time you used the bad word at the Oglethorpe Club?” my father asked me. The crowd shifted nervously. It was not a good moment for them either. I handled it all as graciously as I could. I couldn’t remember the exact incident, but I have been known to speak my mind in numerous places and couldn’t deny that those words have crossed my lips. Another thing: “Coming out” as a medical intuitive. This took enormous guts for me. Even though my clients all know this about me and rely on my intuition and guidance for everything from their mental to their physical to their spiritual health, it was a scary thing to admit. My friend Rochel Blehr, classical Feng shui expert, deserves all the credit for this blog. I just love helping people figure out not only what is wrong but also what will work to make them better. It sounds outrageous, but it’s actually true. I realize that not everybody is actually intuitive, but it is very easy for me to read any person, any animal, anywhere in the world. Another thing: When I was growing up, I achieved some small level of notoriety for slugging Harry Lane, a strapping huge gentleman known for his carvings of furniture, banjos and plantation trunks. Even I don’t know what I was thinking at the time. Another thing: Writing a play that I made the mistake of admitting was about my father. That did not go over well in the family, even though they hadn’t read it yet, seen it produced or knew what the plot was. It was just the thought! Writing about the family! This was produced Off Off Broadway in New York. Private Parts was my first production in New York. This was followed by Raccoon In Every Pot, which I am ashamed to say I think I burned in the fireplace by accident during a rare moment when I was trying to clean out the avalanche of old manuscripts and decades of journals that were taking over my house. I am trying to get up the courage once again to misbehave by writing. This blog is my toe in the water. Another thing: One of my mother’s best friends, who is now deceased, once gave me a sour going over about this whole swearing thing. She was right, of course. I was reduced to tears by the time she was through with me. It is just not lady-like, she concluded. AND I STILL WANT TO SMACK SOMEONE. One year, I was working with the Monsignor of the church where I teach yoga. He helped put the swearing thing into perspective for me. “Monsignor, I am trying really hard to stop swearing,” I confessed to him. I am still not certain where I am going with this refusing to behave thing. Just like my attempts to stop swearing, I try to behave and then just can’t help myself. I never quite got the hang of behaving, so what else have I got to go on? I just end up having to be me, who I really am. Anything else is just too damn difficult. Over the years I tried curling my hair and the hot rollers would just sit on my dresser until I gave them away. I buy high heels but generally they stay in their shoe boxes, completely unworn except for a few minor occasions when there are no other comfortable alternatives. I tried to join my local garden club but got bored and eventually resigned. Every time I go into downtown Atlanta, with its looming office towers and the busy well-dressed people rushing importantly about, I say a prayer. I really mean it. It comes from deep inside my heart! Just as I admire my mother for being president of the Colonial Dames, I have to think there is something in her that recognizes who I really am. Otherwise, why would she have made this picture for me?